So I was invited to speak at the Maryland TESOL (Teachers of English as a Second Language) conference over the weekend, presumably because my Amor and Summer Secrets series features a multicultural heroine who spends the summer with her Spanish-speaking relatives. They also wanted me to encourage the teachers attending to take their students to the library to promote reading for pleasure as a way to improve their language skills. I did all of this, of course, but I still managed to throw in a little side-note on how soap operas changed my grandma’s life. You see, my dad moved to the states from Puerto Rico when he was eight years old. He didn’t speak any English and neither did his parents. So when I was asked to speak at an ESOL conference, the most applicable personal experiences I had to draw from were that of my father and my grandparents. But unlike my father (who did learn English in school and ultimately went on to get a master’s degree), my grandmother learned English by watching CBS soap operas. Like the entire line up. I know this to be true, because she babysat me growing up. So at five years old, I knew the entire plot of The Young and the Restless. (Do you think that might factor in to why I still love soap operas today?) And while my grandmother eventually learned to understand English fluently—particularly conversations involving forged paternity tests and evil twins—she never really felt comfortable speaking it much. Actually, the older she got, the less English she spoke. 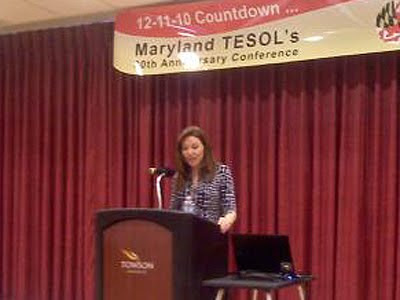 So while I may have been invited to this Maryland TESOL conference based solely on my novels, I did have something personal to add to my little keynote. And the crowd seemed to enjoy it. They listened, they laughed, they cried (okay, maybe not cried) and they asked awesome questions. 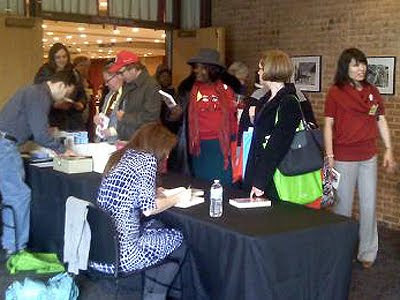 I was at the podium for 45 minutes and was asked everything from how to publish a novel to whether I’ve visited my mom’s family in Poland (not yet). Thanks for inviting me! I had a great time. *The photos were taken with a cell phone. But if you look past the graininess, I swear that’s me! POP CULTURE RANT: Cliff Lee! So at around 7:30 yesterday morning I started getting text messages. Usually this sends me into a panic because I think the only time anyone calls me that early is when someone has died (paranoid, I know). But it turns out we have a lot of Phillies fans in my family who were up bright and early to hear the good news that pitcher Cliff Lee signed with the Phils, forgoing extra cash he would have received in a deal with the NY Yankees. You know what my first thought was when I heard he gave up millions to play here? “Gee, I guess his wife must really want to live in Philly.” Turns out, I was right! Yet somehow this seems to be surprising to people in the sports world, as if his wife stating publicly that she hates New York wouldn’t be a factor to her husband? I dare those reporters to go home to say that to their own wives. Not to mention that sadly Cliff Lee’s son previously had leukemia and is currently in remission; Philadelphia has the No. 1 Children’s Hospital in the country. Is there any father in the world who doesn’t think that played a factor?